We’d love your help. 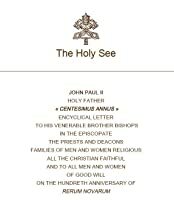 Let us know what’s wrong with this preview of Centesimus Annus by John Paul II. To ask other readers questions about Centesimus Annus, please sign up. The denial of God deprives the person of his foundation, and consequently leads to a reorganization of the social order without reference to the person's dignity and responsibility. This is an essay by John Paul II on mankind and the dignity and necessity of work, on the 100-year anniversary of Pope Leo XII’s 1991 Rerum Novarum. One thing it does is put G.K. Chesterton’s viewpoints on the same subject, and on socialism and capitalism, in a much better context. Their capitalism is a sort of brother to socialism rather than it’s opposite, both being a system of state control, rather than the freedom of who to buy from and work for that it is defined as today (at least among conservatives). He also uses the term “Liberalism” in its European and older sense that in the United States means conservative or at least libertarian, even contrasting it with leftism at one point. According to Rerum novarum and the whole social doctrine of the Church, the social nature of man is not completely fulfilled in the State, but is realized in various intermediary groups, beginning with the family and including economic, social, political and cultural groups which stem from human nature itself and have their own autonomy, always with a view to the common good. It is especially focused on the revolution that had recently occurred in the Soviet Union. Also worthy of emphasis is the fact that the fall of this kind of "bloc" or empire was accomplished almost everywhere by means of peaceful protest, using only the weapons of truth and justice. “Truth” is an important element in this encyclical; it undergirds nearly every argument. As has been mentioned, this error [various forms of totalitarianism] consists in an understanding of human freedom which detaches it from obedience to the truth, and consequently from the duty to respect the rights of others. The essence of freedom then becomes self-love carried to the point of contempt for God and neighbour, a self-love which leads to an unbridled affirmation of self-interest and which refuses to be limited by any demand of justice. The real problem with this very lengthy essay is the lack of real examples. Pope John Paul II specifically addresses this by saying that it isn’t the church’s responsibility to dictate the forms these recommendations take, which is good, but without concrete examples, much of what he writes could be taken as any point on the spectrum between freedom and state control short of full-on communist totalitarianism—and that only because he does specifically call out the previous failed examples of socialism indirectly as in the above quote. In the recent past, the sincere desire to be on the side of the oppressed and not to be cut off from the course of history has led many believers to seek in various ways an impossible compromise between Marxism and Christianity. When people think they possess the secret of a perfect social organization which makes evil impossible, they also think that they can use any means, including violence and deceit, in order to bring that organization into being. Politics then becomes a “secular religion” which operates under the illusion of creating paradise in this world. But no political society—which possesses its own autonomy and laws—can ever be confused with the Kingdom of God. It is not only a question of raising all peoples to the level currently enjoyed by the richest countries, but rather of building up a more decent life through united labour, of concretely enhancing every individual's dignity and creativity, as well as his capacity to respond to his personal vocation, and thus to God's call. The apex of development is the exercise of the right and duty to seek God, to know him and to live in accordance with that knowledge. In this sense, it is right to speak of a struggle against an economic system, if the latter is understood as a method of upholding the absolute predominance of capital, the possession of the means of production and of the land, in contrast to the free and personal nature of human work. In the struggle against such a system, what is being proposed as an alternative is not the socialist system, which in fact turns out to be State capitalism, but rather a society of free work, of enterprise and of participation. But profitability is not the only indicator of a firm's condition. It is possible for the financial accounts to be in order, and yet for the people—who make up the firm's most valuable asset—to be humiliated and their dignity offended. Besides being morally inadmissible, this will eventually have negative repercussions on the firm's economic efficiency. In fact, the purpose of a business firm is not simply to make a profit, but is to be found in its very existence as a community of persons who in various ways are endeavouring to satisfy their basic needs, and who form a particular group at the service of the whole of society. Enormous resources can be made available by disarming the huge military machines which were constructed for the conflict between East and West. These resources could become even more abundant if, in place of war, reliable procedures for the resolution of conflicts could be set up, with the resulting spread of the principle of arms control and arms reduction, also in the countries of the Third World, through the adoption of appropriate measures against the arms trade. This is a fine sentiment, but, again, without examples how would such a thing be to the benefit of humanity if these “reliable procedures” included dictatorships such as Syria or Iran having the same voice as democracies such as France or the United States? It is necessary to go back to seeing the family as the sanctuary of life. In the face of the so-called culture of death, the family is the heart of the culture of life. Among the most important of these rights, mention must be made of the right to life, an integral part of which is the right of the child to develop in the mother's womb from the moment of conception; the right to live in a united family and in a moral environment conducive to the growth of the child's personality; the right to develop one's intelligence and freedom in seeking and knowing the truth; the right to share in the work which makes wise use of the earth's material resources, and to derive from that work the means to support oneself and one's dependents; and the right freely to establish a family, to have and to rear children through the responsible exercise of one's sexuality. It’s hardly surprising that the leader of a 2,000-year-old bureaucracy would speak in bureaucratese, but it is disappointing to hear it from the successor to Saint Peter. I would expect more solidity from the rock of the Church. That said, these thoughts, like most of my Goodreads reviews, are mostly notes for me to remember, not reviews in general (although I do hope they can inform conversations, which is why I note them for later use). Despite the bureaucratese, this is a very interesting and occasionally even inspiring post-Soviet document about the Church’s view of what economic progress should mean following the decline of Marxism. It is ultimately about the primacy of God, as incarnated in family and faith, and that any political or economic system that interferes with family and faith is by its nature a totalitarian system and one which also by its nature will descend into violence sooner or later. Despite the occasional evasiveness of the recommendations, this remains a powerful statement about the responsibilities of individuals and the dangers of the state abrogating those responsibilities to itself. The State or the party which claims to be able to lead history towards perfect goodness, and which sets itself above all values, cannot tolerate the affirmation of an objective criterion of good and evil beyond the will of those in power, since such a criterion, in given circumstances, could be used to judge their actions… In a world without truth, freedom loses its foundation and man is exposed to the violence of passion and to manipulation, both open and hidden. "There is a reasonable hope that the many people who profess no religion will also contribute to providing the social question with the necessary ethical foundation...I also addressed an appeal to the Christian Churches and to all the great world religions, inviting them to offer the unanimous witness of our common convictions regarding the dignity of man, created by God. In fact I am convinced that the various religions, now and in the future, will have a preeminent role in preserving peace and "There is a reasonable hope that the many people who profess no religion will also contribute to providing the social question with the necessary ethical foundation...I also addressed an appeal to the Christian Churches and to all the great world religions, inviting them to offer the unanimous witness of our common convictions regarding the dignity of man, created by God. In fact I am convinced that the various religions, now and in the future, will have a preeminent role in preserving peace and in building a society worthy of man." A great expose on the social issues of the day, on the hundredth anniversary of Rerum Novarum's publication (the "first" social encyclical of the modern era). As relevant today as it was in 1991. A look back at Rerum Novarum : here, Pope John Paul II writes that capitalists shouldn't get overconfident after the fall of the Soviet Union. The pope doesn't mention labor unions as much as Pope Leo XIII did in the original. Instead, the Church admits that capitalism is a great wealth-generation machine, but cautions that man (not wealth) should be at the center of society, in order to keep up a healthy and moral culture. This is a masterful work which lays out the balance between the individual's freedom and obligation to support themselves and their responsibility to balance work life, family life and rest time. John Paul II took plenty of time studying the concepts of economics so to make a more complete critique of economics from the perspective of Catholic Theology and it shows in this work. One of the best works on economics and morality I have ever read. Catholic Church's Social Doctrine. 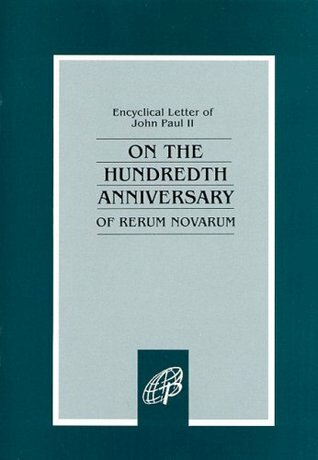 On the hundred years of Rerum Novarum. we're gonna have to actually redact this one going forward.